Of all the colours I got in my Zoya haul, Faye cried out to be tested first. Oh my what a gorgeous colour! Faye is a duochrome with a purple/pink base and loads of gold glitter. It took three thin coats to be opaque and in my haste to stamp her, I forgot to take any pictures doh! 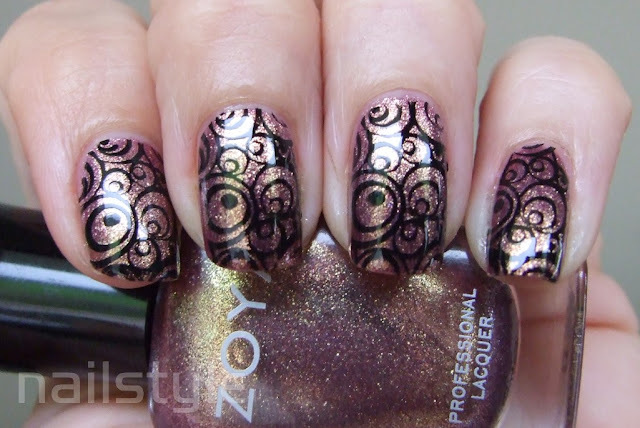 Anyway, prior to stamping my nails looks very similar to the polish inside the bottle in the pictures below. Sorry there's a lot of photos but it was difficult to capture how amazing Faye looks in different light. And then I topped her with China Glaze Matte Magic. Oooo I love the matte version!! Beautiful, beautiful, and beautiful! Shiny and matte finishes work nicely for this design. Zoya polishes are amazing. Thanks for your comments. I'm undecided on this one, it looks lovely in the bottle but I think I like it better in there! this one looks fantastic in matte!